Welcome back and thank you for coming to read this week’s installment of my horror heritage via West Virginian beginnings. This week, I’d like to talk about something that bothers me personally. Some of the things that I’ve talked about so far in this series only give me a passing pause or are pure entertainment. Not today’s topic. The return in one form or another of a deceased loved one. Monsters are fun! True, if I saw one personally, I don’t think my reaction would be anything less than hysterical. Haunted houses are tourist attractions and I maintain that I’ve lived in one. I’ve had picnics in cemeteries, for crying out loud! But the thought of being visited/haunted/stalked by a dead loved one legitimately creeps me out. When I was a child, I had three grandparents and six great-grandparents. Over the years, I’ve lost many loved ones, the most traumatizing being the death of my maternal grandmother when I was thirteen. I’m now, at the age of thirty-four, left with just one grandparent. All the rest are gone. My last great-grandparent almost made it to triple digits. I was almost thirty when she died. If I ever walked into a room to see a hazy form of one of these people sitting in a chair waiting for me, my hair would turn white. Referencing Ruth Ann Musick once again with The Telltale Lilac Bush, this book is brimming with stories of returned kin and lovers. True, it is mostly for reasons of revenge, but there are the softer tales of seeing a child one last time or hearing the sweet humming of a mother’s favorite song. My mother was child #7 for her mother. She never knew her father who ran off before she was born and died not long after. Though their relationship was far from ideal, by the time my mother was an adult, she and her mother had gotten very close. I was the favored grandchild and my brother nearly equal in her esteem. My grandmother wasn’t young when she died, but she wasn’t very old either. A hard life of poverty, abuse, and self-destruction took her from her loved ones suddenly, leaving us shocked and broken. My mother told me a story that bothers me to this day. Something that happened to her a couple of months after my grandmother’s funeral. My mother worked at a small university in a neighboring town and was driving to work one morning, numb to the daily repetition of the commute when she was suddenly aware of the distinct smell of her mother. Now, you might think maybe my mother got a whiff of her own perfume or perhaps the smell of fabric softener on her clothes, and mistook that for her mother’s scent. You’d be very wrong. An intense fear of snakes meant that my grandmother always had a very distinct scent, one you don’t often encounter in this modern world of ours. 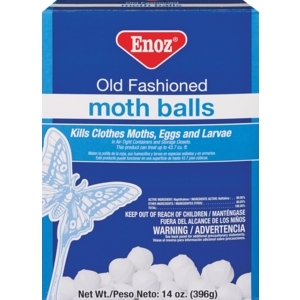 My grandmother smelled like moth balls. You may know them for packing away clothes, but they were also a folksy way to keep snakes off of your property. My grandmother, terrified as she was of snakes, kept these blue boxes all over the place. We know now how dangerous that is, but the pungent smell of these suckers will always bring memories of my grandmother to the fore. So when my mother, in her small clean car that had no moth balls in it, suddenly got a strong whiff of them, she became concerned. She was still mourning the loss of her mother and the pain was still sharp, but the question of “why” bothered my mom more. She worried that my grandmother had come to be with her at her own time of death and terrified of a car accident (my mother is a scary driver), my mother slowed down and drove as carefully as if her car were made of glass. Later she told me that she wondered if it was just Grandma coming to her to say goodbye, letting her daughter know that everything was okay now. It comforted her. And bothered the hell out of me. I love you and miss you, Grandma, but don’t come visiting or I’ll never be okay again! Now, last week, I mentioned Finnegan’s Wake as a clue to today’s topic and I’d like to touch on something else about that story, something that is mentioned in the Stephen King movie, Creepshow. I’m mostly Irish with a few sprinkles of other nationalities. Most of my Irish heritage has been lost to time. We’re American at this point with little to no ties to the old country. Except for the odd little thing here and there. Like drinking at a loved one’s grave. We don’t. We REALLY don’t. If you’re a fan of James Joyce and was able to make it through Finnegan’s Wake, you know why. If you’ve seen Creepshow, the segment about the old man/zombie screaming for his cake (Father’s Day), you know why. You don’t share drink with the dead, particularly whiskey with the Irish. They always sit up and want more, and for a bit of a chat and party. You can’t keep a good Irishman down when there’s good drink, and good talk. Luckily, I don’t care for whiskey or bourbon, so when I go feel free to partake. I’ve always found that funny. I love a good superstition, don’t you? Join me next week as this series continues where we talk about the baddies. Bad, mean, malevolent hauntings. It will be fun!